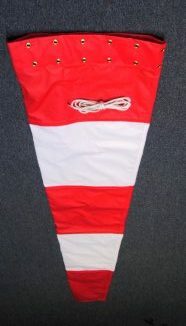 Option to replace internal hoop and snap clip harness with strengthening to the top opening of the windsock (all sizes) and have two rows of brass eyelets fitted to lace onto an existing hoop or frame with braided nylon rope (supplied). Manufactured to order. Price £39.00 exc. VAT and Carriage. CALL US ON 01780 740644 we welcome Credit Card Payment. Alternatively 4place an email o4rder and we will respond to process your purchase.